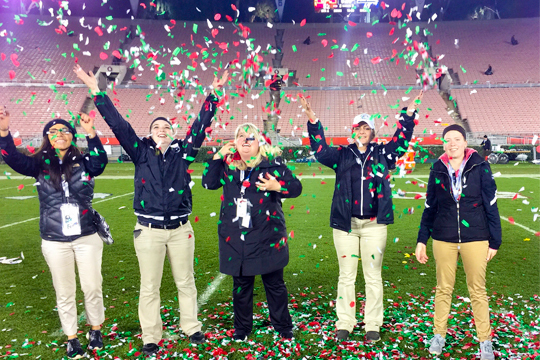 Students from SEB 453 celebrate the end of an eventful week at the Tournament of Roses, throwing confetti at the 50-yard line upon completion of the Rose Bowl. For students in Concordia University’s Sport and Entertainment Business (SEB) program, there is no off-season. Because of tremendous University partnerships and the students’ impressive demonstration of professionalism and critical thinking, Concordia’s SEB program is participating behind the scenes in the highest profile athletic events in sports. Since June 2015, over three dozen Concordia students have participated internship opportunities involved with 11 major sporting events, including Super Bowl 50, NCAA Final Four, NBA All-Star Weekend, and NCAA College World Series. Up next is Super Bowl LI in Houston, TX, where SEB student Joe Rawlings, now an alumnus of the University, was asked to return to assist with the event after completing a successful internship at last year’s Super Bowl. Third party sports travel and event management companies, like Concordia’s partner PrimeSport, will come together with hallmark sporting events to create weekend or game-day packages for fans that grant them the ultimate game day experience: best seats in the house, meeting your favorite players, or VIP treatment before and after the game. It’s the logistics and planning behind the scenes of these events where Concordia students are given a chance to be a part of the operational intensity. “We jokingly say ‘from toilets to truffles’ because our students are so involved with every detail at every level,” said Bialkowski. Just a few weeks ago, the senior seminar class, SEB 453, spent a week in Pasadena, CA for the Tournament of Roses. Nine students spent their fall semester course assisting PrimeSport with the strategic planning and integration of the Official Rose Bowl VIP Hospitality events taking place in an exclusive area, named ‘The Village,’ just outside of the Rose Bowl Stadium. Students were involved with the processes and decision-making for the event layout, parking, signage, city permits, insurance, graphics, safety plan, coordination with city officials, production schedule, and everything in between. And that’s just before the event. “Our students are invaluable in these situations because they are so immersed in the planning on the front end, that the moment they arrive to these events they know exactly what’s going on and what they need to be doing,” said Bialkowski. Once at the event they’ve helped plan, the students will serve as point-people for questions from vendors and fans, are assigned as liaisons for event sponsors, and are on surveillance for anything needed from their partners at PrimeSport. Despite the long days, sometimes arriving at 6:00 a.m. and not returning to the hotel until midnight, the spirit around the nation’s most popular sporting events and the big names and sponsors that are drawn into the VIP hospitality treatment make the hard work feel more like an exciting award show.